The recent uprisings which toppled Ben Ali in Tunisia and Mubarak in Egypt spread fast throughout the Middle East and North Africa. They overtook Libya, as well. 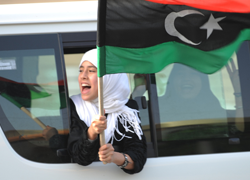 Inspired by the revolutions in Tunisia and Egypt, protesters and demonstrators filled the streets in several Libyan cities. Qaddafi called those opposing his brutally repressive regime, “cockroaches” and “rats” who did not deserve to live, and his bloodthirsty forces, including mercenaries, indiscriminately executed any suspected rebel. The UN Security Council invoked for the first time ever the “Responsibility to Protect” (R2P), an emerging new norm of international law. Condemning the violence and use of force by the Libyan government against civilians and welcoming the similar early condemnation by the Arab League, the African Union and the Secretary-General of the Organization of Islamic Conference, the UN Security Council adopted a resolution on February 26, 2011, demanding an immediate end to the violence, and urging the Libyan authorities to act “with the utmost restraint, respect human rights and international humanitarian law.” It also decided to refer the situation to the International Criminal Court and imposed sanctions on Libya, including an arms embargo, a travel ban against 16 named Libyan government officials, including Qaddafi, his sons and daughter, and freezing the Qaddafi family assets. As the Libyan situation worsened and Qaddafi continued his brutal oppression in defiance of the Security Council’s resolution, the Council adopted Resolution 1973 on March 17, 2011, authorizing member states “to take all necessary measures . . . to protect civilians and civilian populated areas under threat of attack.” It also established a no-fly zone and further strengthened the sanctions imposed in the earlier resolution. Subsequently, on June 27, the International Criminal Court issued warrants of arrest for Qaddafi, one of his sons, and Libya’s intelligence chief, on charges of crimes against humanity (murder and persecution) committed through the state apparatus and security forces. Since Libya is not a party to the Rome Statute that created the Court, it is subject to the ICC’s jurisdiction through the UN Security Council resolution. Pursuant to the call in Resolution 1973 authorizing Member States “to take all necessary measures . . . to protect civilians,” NATO soon began its air campaign against Qaddafi’s forces. The context was the imminent attack on Benghazi by Qaddafi’s forces and the feared resulting massacre. After six months of NATO’s assistance to the rebels, the new NATO-backed and internationally recognized administration, the Libyan National Transitional Council (NTC), was established in Tripoli. The United States and more than 80 countries have recognized the NTC as the legitimate government of Libya, which has also replaced the old Qaddafi regime at the UN. The interim Libyan government has received part of Libya’s frozen assets and it is receiving political, technical and economic assistance toward the challenging task of rebuilding the country after 42 years of abuse under the Qaddafi regime. The “responsibility to protect,” the new norm invoked against Libya, is a promising development. It should be recalled that the international community was a silent observer witnessing the killing fields of Cambodia. And the genocide in Rwanda, the Srebrenica massacre and other mass atrocities prompted then-Secretary-General Kofi Annan to seek effective measures for “swift and decisive action” to prevent genocidal actions and to mount an appropriate response. The Canada-based International Commission on Intervention and State Sovereignty’s report, “Responsibility to Protect,” was the basis of subsequent discussions in the UN. Eventually, in September 2005, the UN World Summit of Heads of State and Government adopted in its World Summit Outcome Document the core elements of R2P. The basic element of the concept is that the state has the responsibility to protect its population from genocide, war crimes, ethnic cleansing, and crimes against humanity, as well as their incitement. The world leaders added that when peaceful means are inadequate and national authorities are “manifestly failing” to protect their populations from these crimes, they are prepared to act collectively, “in a timely and decisive manner,” through the Security Council, in accordance with the Charter and on a case-by-case basis. After 2005, the Security Council referred to the R2P concept in two resolutions prior to its action in Libya. Ban Ki Moon, the current Secretary General, has outlined the three pillars of R2P: 1) the responsibility of the state to protect its population from these crimes; 2) international assistance and capacity building in states so that they can provide that protection; and 3) timely and decisive response when a state is “manifestly failing” to protect its population. The General Assembly has been discussing the concept in order to explore effective means to operationalize it. NATO’s action in Libya has come under scrutiny and criticism. Its mandate to protect the civilian population in Libya has, critics assert, been stretched to changing the regime. Why has R2P been invoked to support military action in Libya and not in Syria, they ask. Time will tell whether NATO by overstepping its mandate in Libya may have damaged the concept. In any event, much more needs to be done to ensure that the concept is operationalized by setting standards to determine when military action is appropriate. R2P is a work in progress, but it is undeniable that the concept is a monumental step forward.